Moving to a more rural part of the country was a good move. It's beautiful in the Carolinas--and peaceful. But I do miss many things about the Texas town where we lived. I could find organic foods and those without preservatives much easier. (I'm super sensitive and have a host of food allergies.) Now, travel time to get those things is about an hour each way. But the good news is, the traffic is, well, non-existent! I do NOT miss Houston traffic one bit. 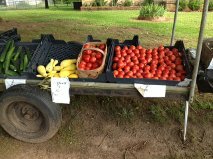 Beautiful tomatoes, cukes, yellow squash and peppers! Nice, huh? 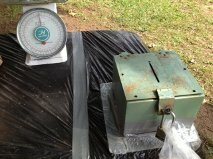 Just slide your money in the slot of that old lock box--and there's a scale for your convenience--I guess for when they put out fruits and veggies sold by the pound. That's not the case just yet. Refreshing throwback to a less busy time? You betcha! This is how they do it in rural South Carolina. 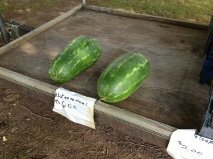 And the watermelons? One dollar. Yummy!!! We lived in Beaufort for five years & loved it! We missed our home state of Texas though so we moved back in 2000. I miss Beaufort--the ocean being five minutes from our house & I miss historic downtown Beaufort & Lady's Island. The people were wonderful. I'm glad you're liking living in SC. I love SC..and I'm glad you are getting comfortable here. It's a land of friends, hugs when you least expect them, & smiles all around. Love the fresh veggies! You've landed in God's country, Leann. Enjoy! I am happy that you enjoy living in the Carolinas now. I have seen stands like that here in Holland as well, mostly in rural but touristic areas. I am a sucker for those stands that sell jam. Homemade jam is so much tastier than supermarket stuff. There is a stand like that here in northern Wisconsin too. They have talked about not having it there since people are sometimes not very honorable but then they come back with it. I would so much rather buy my vegetables there than the store, they have so much more flavor! We call it our local Farmer's Market. We have a working farm down the street (and I live an hour outside of NYC, so that's saying something) and although the farm store isn't on the honor system when they're open in season, they are during the off-season. The chickens lay year-round, after all, so if you want a dozen eggs, you run over to the farm store, grab them, and leave payment in the box on the counter. Like your husband, I've always liked my corn on the cob raw. My parents used to grow corn, and it NEVER made it to the dinner table. Between four kids and various garden critters, no cob went uneaten before reaching maturity! You are so lucky to have that farm so close! My husband had a big garden in our last house and he grew corn. You're right. Little of it ever made it inside the house! And it was always hilarious to see a squirrel scurrying across the yard draggin a corn cob as big as he was! I love farmers markets and roadside stands. I like to keep it local. I have a small garden for my tomatoes and green beans and cucumbers. But, I haven't learned the secret for zucchini's, which we love to grill with onions and mushrooms. Most people complain about having too many zucchini's. I have beautiful plants and no fruit. So, I buy them at our local Farmer's Market on Friday's, I also love the cantaloupes. Me, too, Jeannie. In Texas we could grow zucchini and eggplant FOREVER. But when my husband managed to grow cantaloupe one year that didn't get eaten alive with some vine worm, they were the BEST cantaloupe I have ever eaten. I first saw an " honor" stand in New England, probably Maine. Living in a city it was hard to process at first. I kept looking around for the owner. I love Farmer's Markets and we have several in our city that I try to visit often. My sister's dog also liked corn on the cob.